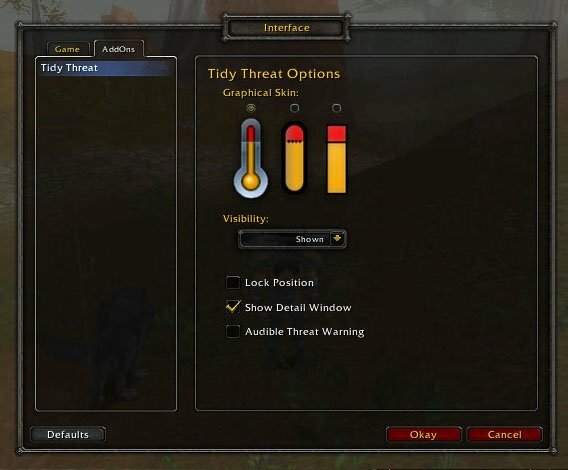 Tidy Threat is a simple threat monitor which is simple enough for a novice to understand, yet powerful enough for a Tank. While in combat, the status bar grows upward indicating how "hot" the enemy thinks you are. Causing damage or casting heals will raise that level. If you reach the mark on the thermometer, the enemy will turn and start hitting YOU. As you continue to attack, the bar can continue to rise into the RED area, indicating the amount of threat that you would need to lose in order to shed the attention of the bad guy. If you're DPSing: Don't go into the RED! If you're tanking: Stay in the RED! The status bar shows your threat compared to the next-highest threat for the rest of your group. If you are the top threat holder, it will also show how much your threat exceeds the next highest. In other words, if you are tanking and the bar extends above the line, into the red, you've got solid aggro. No mode changes are required for Tank vs DPS usage; The interface is universal. 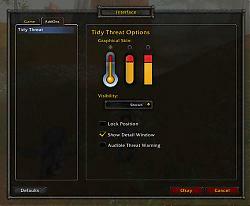 For additional data, players can enable the Detail Window, which will display real threat numbers. Type '/ttt' into the chat window to bring up the configuration panel, or right-click the Tidy Threat frame. I'm not going to bug you by popping up an ad whenever you hit "Download". If you enjoy this addon and want to send a monetary "Thank You", please visit our Pledgie page by clicking on the button, above. * Modified /ttt reset to flush the old variables... running that command should clear bad config data, which was resulting in LUA errors. * Threat Lead extension bar range has been changed from 33% to 68%. What does the the error log report? Anyone else getting piles of LUA errors from this in battlegrounds since the 5.04 patch? The method used in this addon to handle Mirror Images/Fade no longer works since several patches. The Blizzard API now returns 0% threat while MI is active. The only way to support it now is as Omen does - examining COMBAT_LOG_EVENT_UNFILTERED, storing the Threat information at start of MI and then adding dmg*100 for every damage dealt during MI to this value. I can give pointers in the Omen.lua which show how to do this if needed. Last edited by Saiket : 01-20-11 at 05:33 PM. Re: Will there be further development? I appreciate your comment, and that you liked this addon in turn. Not much is happening with this addon because nothing has needed attention. It was working as-intended for me just five minutes ago on my hunter. The last update was made a day after my last comment post. The fixes discussed in previous messages were made, problems resolved, and no other action was needed. I don't have a clue what could be interfering, but if you send me a PM/email with addon list, I'll see if anything rings a bell. You could also try deleting the saved variable file in the WTF folder, and see if that helps. 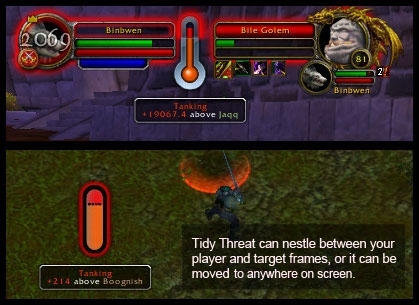 This addon had real potential for a simple threat indicator. It worked for me up until cata release day. 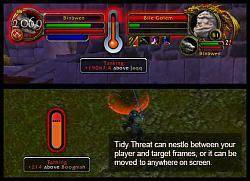 It now shows the threat 'container' once combat starts but no color or gradient change occurs indicating the level of threat on the current target. The container doesn't 'fill up' anymore if you will. As a healer I liked your mod as it gave me a good gauge of where I was on a threat chart, and how much I could continue to gather threat until the string broke, so to speak. I'm going to play around with it some to see what if anything is interfering with the threat indicator malfunction. Perhaps another addon ... although from the looks of the posts here nothing more is to come. Too bad, but things change. Will there be further development? I'm having the same problem as Zidomo. I really liked this addon, but the accidental opening of the configuration window makes it unusable for me now, because I have it placed pretty much in the center of the screen, on autohide, so it happens to me all the time. Edit: Hey, I think I fixed it. When I edit TidyThreatCore.lua and change "AllowMove = true" to "false", apparently it stays locked and the menu doesn't pop up anymore. Last edited by bunghead : 11-11-10 at 07:15 PM. Appreciate the WoW 4.x update. Unfortunately, v2.1 has a similar issue an earlier version did before it was fixed: it refuses to recognize the Lock Position setting. Set that (including setting Visibility: In Combat), go into combat (or whatever), it remains locked throughout the session. But log out and relog...its back to movable (and Lock Position unchecked) despite having set it before. Its 100% reproducible on relogs. Another oddity: rightclick the hidden frame (accidentally or otherwise) and it will open the Blizzard options panel. When the frame is hidden, it should be click-through. Last edited by Zidomo : 10-25-10 at 10:30 PM. That should fix the issue. I will update the download tonight when I get back to my computer, but you can make the change to your own file if you want the fix right now.